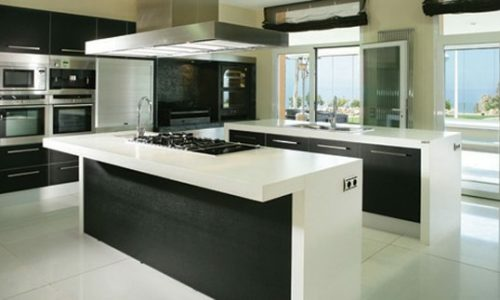 At Surrey Marble and Granite, we’re stoneworkers who fit worktops. This means that we have the knowledge and expertise to cut and fit stone with millimetre precision – even when it’s not square. While many kitchen fitters can only work with factory cut pieces, we do our own cutting and shaping in our Surrey workshop. This means that we’re able to tackle all sorts of worktops other firms can’t handle, including dealing with wonky walls, oddly-shaped sinks and other quirky features. Here are a few examples. Here the marble bathroom worktop has been cut to fit a marble sink made of the same material. 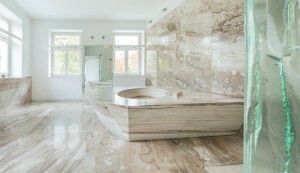 The effect appears seamless, making it look like the entire bathroom has been carved from a single slab of stone. 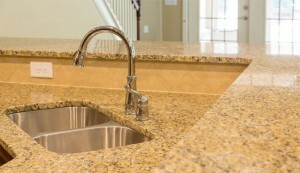 The unusual shape of the sink is picked up by the curves in the worktop. While you might not want such a dramatic look at home, using curved shapes can make moving around a small space easier and more comfortable. Curves also draw the eye naturally, creating a clear visual path through a space. Working around sinks and turning corners is a standard part of our cutting and fitting service. We create templates in your actual kitchen instead of working from measurements, which ensures that all the critical details such as wall angle, position of the sink, shape of the hob, have been fully accounted for. This templating also gives you the freedom to choose a more dramatic shape for your kitchen. Whether you want a classic L or U shaped kitchen, a curving S-shaped island or even an H-shaped piece of stone to fit around the sink and the hob, we can provide it. A kitchen island is a great way to create a visual break between the living area and an open plan kitchen. Double-height islands like the one shown have multiple uses. 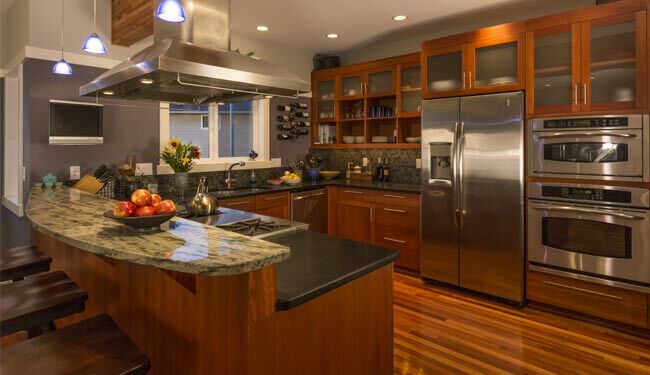 Here, the sweeping overhand is not only a beautiful piece of granite but a practical breakfast bar where guests can chat with the chef or kids can do homework. 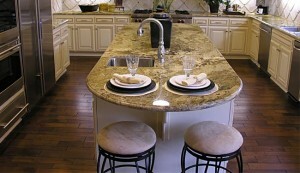 The contrasting stone on the lower worksurface finishes the look. Each piece has been carefully chosen and cut to fit, creating a stunning final effect. Using off-cuts from your main slab to create stunning shelves or windowsills is a great way to finish your kitchen. Here, a short backsplash has been topped with granite that matches the kitchen worktops. It not only makes the sink easier to use and reduces mess, but screens the food preparation areas from the living room without hiding the chef. Floating shelves are another great use of stone off-cuts. The stone is self supporting, so can be anchored to the wall without brackets reducing visual clutter while still giving you somewhere to store favourite items.